How Do I Preserve My Shrubs for the Winter? While your mind is probably on the holidays, vacations, and preparing your interior home for the winter, there is more to winter prep than just that. Along with blocking leaks and wrapping pipes, the impending winter necessitates care for the outdoor home too. More than just storing patio furniture in the basement, outdoor winter care entails careful protection of plants growing around your yard. No one wants to put in the hard work over the spring and summer just to see it all ruined by the snow and freezing temperatures. Protecting your garden starts with knowing how different plants are able to hold up against the bitter cold. Take a look at this map of United States growing zones to get a feel for what plants can or cannot stand the cold weather before allotting resources to preserve what’s growing in your yard. Here’s a look at some techniques you can employ to help your shrubs survive the winter. Before the snow starts falling in earnest, you have to give plants proper attention to boost their chances of outlasting winter. It all starts in the growing season. Give plants continuous water throughout fall before the ground freezes, and during intervals in the season where the ground thaws. This way, the frozen ground that comes late in the year has a smaller chance of drying a plant’s roots out. Water also helps to insulate the ground surrounding the roots. Another measure you can take in the early stages of preparation is mulching. Acting like a covering on the colder days and nights of winter, a few inches of mulch covering the base of your perennials will keep their roots insulated. Clearly these preliminary measures do you little good right now, but they’re something to consider next Spring and Summer as part of the full year cycle of plant care. Sometimes the basic prep work isn’t enough. By the time sub-zero temperatures hit, you realize there’s more to be done to keep your shrubbery sheltered. The most effective way to help your plants endure the winter is to create a protective casing for your greenery. More so than frigid temperatures, the harsh winds of the winter can really harm plants in the yard. Even evergreens are susceptible to injury from a combination of the wintertime wind and sun. To combat this, use any one of a wide variety of options to create a lasting barrier for the winter. The most common fix for smaller trees and shrubs is a burlap sack layer framed around the plant with stakes in the ground. Keeping the foliage untouched, the burlap provides a buffer between the plant and the elements. Other materials such as flannel sheets work as fine substitutes for burlap. For smaller plants, you can even use inverted pots or plastic storage items as covers. Even placing leaves, straw, or hay between the plant and the casing can provide a cushion of extra padding to insulate the plant. 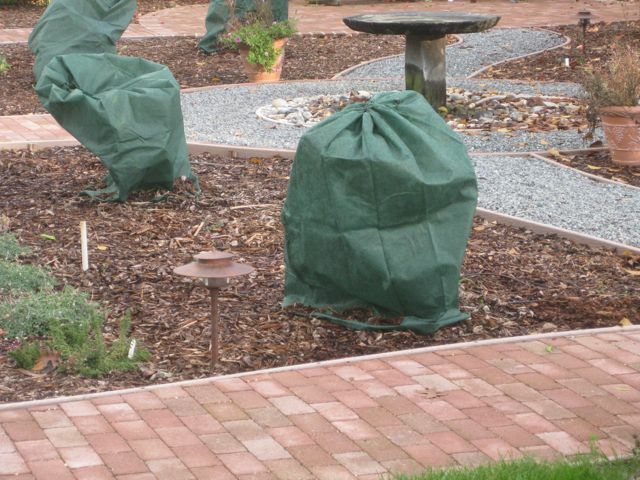 Encasing your plants gives them the best chance at holding off the potential of destruction in winter. While protective units can be crucial to keeping your plants alive during the long winter, just as important is knowing when to remove them. Whether it be the night after a freeze or at the end of the season, taking off the cover at the appropriate time is necessary so that moisture doesn’t build underneath it. This dampness could then freeze on the plant at night and damage it. Tending to a garden all spring and summer takes hours of care and attention. You don’t want to see Mother Nature take her toll and ruin that effort in just a night’s work of ice and snow. By taking a couple of cautionary measures as the temperatures start dropping, you can save your yard from falling to the bitter cold of winter. This entry was posted in Outdoor Home Improvement, Weather. Bookmark the permalink.